Real Madrid got back to winning ways this afternoon with a comfortable 3-0 over Espanyol despite being reduced to 10-men in the second half. Jame Rodriguez, Gareth Bale and Nacho got the goals that extend Los Blancos’ lead at the top of the league to four points and will provide a timely boost in confidence ahead of the second leg of their Copa del Rey tie against Atletico de Madrid this week. 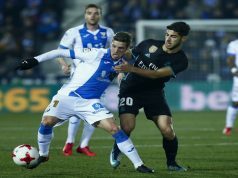 Espanyol, sitting in midtable, came into the game confident they could get something against a side that had lost two matches in a row – three including the friendly loss to AC Milan in Dubai over Christmas. But Real were not in the mood to be picked apart, and were infront within the first 15 minutes when James Rodriguez tucked home past Kiko Casilla after receiving Cristiano Ronaldo’s cross. French defender Raphael Varane could have extended the lead shortly afterwards but he header went inches past the wrong side of the post. However, Real didn’t have to wait long to move further ahead. 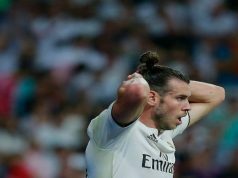 Gareth Bale, criticised in some quarters for being too selflish last week against Valencia, scored a wonderful free kick off the post on the half hour mark. Los Blancos were on top for much of the first half, but the visitors thought their luck would change in the second period when left back Fabio Coentrao was sent off after clashing with Jose Canas. But Carlo Ancelotti’s men had other ideas and continued to push for a third, despite being a man down. Ronaldo and Isco were both guilty of spurning good opportunities. Central defender Nacho had his shooting boots on though and showed the rest how it’s done after receiving a decent pass from Alvaro Arbeloa. 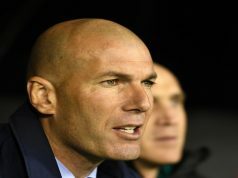 Real’s job for the day was done, and the attention now switches to the Copa del Rey and how to overcome the 2-0 deficit.